Boys Life Magazine Cover 1926. 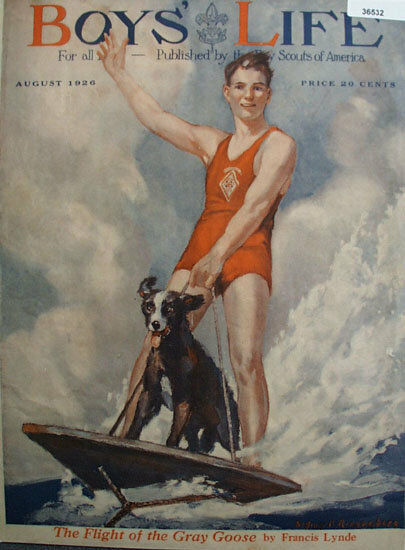 This color August, 1926 Boys Life Magazine cover published by Boy Scouts of America shows picture by Sidney H. Riaspnbeys of boy and dog on surf board in front of big wave. Also on cover The Flight of the gray Goose by Francis Lynde. Magazine tear sheet picture is taken through plastic and may show wrinkles or crookedness that is not in the ad. This Original magazine tear sheet measures 10 inches wide by 13 1/4 inches tall.